A range of unique, bespoke solid wood table tops have been crafted by Warings Furniture for three sites within the Jamie's Italian and Union Jacks collection of restaurants. The solid iroko table tops feature a striking brandished logo carefully burnt onto the surface through a bespoke stencil before being sealed with oil for protection. 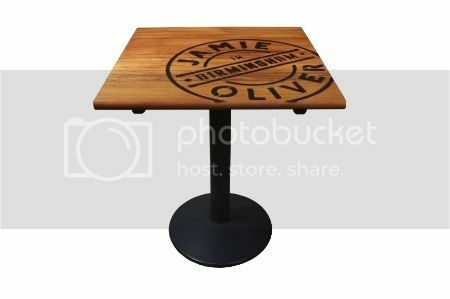 Any logo can be used to create the effect, resulting in an individually unique table top with quirky character and a nostalgic, artisan look for exterior use. Stuart Smith, Director at Warings Furniture, explains: “Although the principle behind the technique is simple, the effects of the branding are just stunning when set against the natural surface of the wood. Warings Furniture has more than 25 years’ experience in design and manufacture and is the preferred furniture supplier for many of the UK’s leading restaurant, bar, hotel groups.